The Conodoguinet Creek Water Trail Guide and Map (.pdf) provides park and recreation information for approximately 40 miles of the creek. This guide outlines two float trips: one short route (Trip A) west of the Carlisle Dam and a second extended route (Trip B) east of the Carlisle Dam. There is no public portage at the Carlisle Dam. Do not attempt to navigate over the dam! See trip ideas below. Use of the creek is limited to daylight hours and access along all points is free. 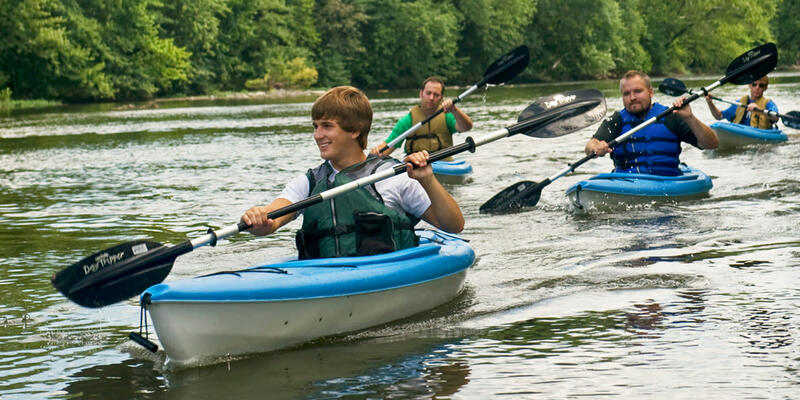 You will need to provide your own kayaks, canoes, or tubes. Access points along the creek may occasionally be closed. Click here to get the latest updates. You may also encounter natural hazards along the creek such as downed trees that may impede your trip. The Visitors Bureau does not maintain the creek and we are unable to provide warnings about them unless they are reported to us. Birding: Be on the lookout for a herons, kingfishers, osprey and eagles. Canoeing/Kayaking/Tubing: As a Class 1 stream, the Conodoguinet is characterized by easy moving water with a few riffles and small waves, suitable for a beginner. The best stream flow conditions generally occur between November and April. The Conodoguinet is usually canoeable throughout March and April and into mid-May. However, in a wet year, stream conditions may remain favorable through July. Fishing: Smallmouth bass, rock bass and sunfish are the most common gamefish found in the Creek between Carlisle and Harrisburg. The Pennsylvania Fish & Boat Commission also stocks tiger muskellunge fingerlings in the creek. View details about Trip A & B and access points in the above downloadable guide or by clicking on each park. Be sure to check stream conditions and real-time water levels before embarking on a float trip.